On last night’s The Late Show With Stephen Colbert, the host was joined by actor and comedian Zach Galifianakis, there to promote his new film Missing Link. 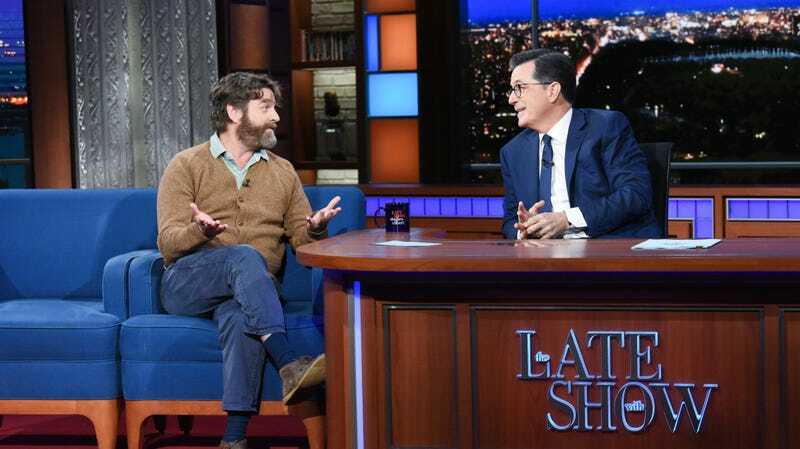 Galifianakis, who knows a thing or two about interviewing people, is a reliably entertaining (and often enjoyably strange) late night guest, and this Late Show appearance is no exception. But the segment took a bit of a turn when the two men entered into some light banter on the subject of the two Carolinas. That’s where it started. But while the whole conversation was obviously in good fun, things got playfully heated when Colbert raised the issue of barbecue. His feelings, in summation: North Carolina, what the hell are you doing to that perfectly good meat? Skip to the 4-minute mark for the sauce smack talk. ZG: Do you really have a bias against people from North Carolina? SC: No, I only have a thing against your barbecue. ZG: Oh. Oh, now those are fighting words. SC: I know. I think we’ve received letters from the governor of the state saying, “Come down here, taste our barbecue, and then I will punch you in the face.” They are really mad at me down in North Carolina. I love North Carolinians. I love the Outer Banks, I love the mountains, I love everything about North Carolina other than that damn vinegar stuff that y’all put on the barbecue. You have perfectly fine, dry-rub, smoked barbecue, and then you come in there and just [expletive] all over it with vinegar. What are you doing? What are you doing?! So there you go, North Carolina. Get mad. Galifianakis magnanimously responded to this inflammatory speech with a gesture of goodwill, saying, “We can be different, Stephen. We don’t have to build a wall between us.” No further slights were offered, and peace was restored to the Late Show stage.